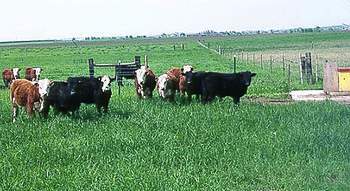 Photo by Eric MouselAccording to SDSU's Eric Mousel, cattlemen should be thinking about planting summer annuals such as sedan grass or millet. As grass dries up in the late summer months, cattle need these types of annuals to graze on. The grass is greening up and blowing in the wind. The herd bulls are itching to get back out with the cows. Hay is running short and it’s time to head out to pasture. As those cow-calf pairs move to pasture, it’s time to start thinking about implementing an intensive grass management program for your summer grazing months. While rotational grazing isn’t a new concept, there has been an increase in the number of cattlemen taking part in this system to increase grass efficiency for their cattle. Eric Mousel, professor of Range Livestock Production at South Dakota State University, has helped countless cattle operations implement rotational grazing systems on location. Recognizing that each ranch is unique, Mousel has general tips for cattlemen to keep in mind as they start thinking about their summer grazing programs. Mousel is an expert on identifying the many things cattlemen should consider when analyzing their summer grassland resources and their management plans. With that preparation in mind, it’s time to start considering other factors such as grass and water resources and the geographical region of the ranch. With pasture grasses segmented by croplands, it’s important to have a solid plan when trying to implement a rotational grazing system.